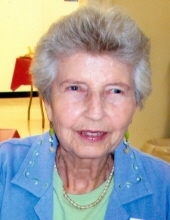 Louise (Lou) Ryan Grimm died on Thursday, March 21, 2019 at Clinch Valley Medical Center in Richlands, VA. Born near Princeton, WV on May 16, 1925, she was the daughter of Claude Ashby (C.A.) and Lillian Naugle Ryan. She was a 1942 graduate of Princeton High School and a 1946 graduate of Concord College,(now University) with a BS degree in chemistry and math. While at Concord she married Edward F. Grimm and they had one daughter, Lara Grimm Addison. She is survived by daughter Lara and husband Tom Addison of Pounding Mill, VA; one cousin, Tom’s brother, Larry Addison, a wonderful church family, former students, and countless friends from Maine to Florida. Lou taught 5 years at Pocahontas High and 25 years at Richlands High School, where she was math department head for most of those years, and as a guidance counselor. She earned a MS degree from Virginia Tech in 1977, and retired in 1985. She still kept in touch with many of her former students. She served in several capacities at the Cedar Bluff United Methodist Church. She was a 43 year member of the Delta Kappa Gamma Society. She enjoyed painting watercolors, and earned several awards locally and in Florida. Lou was on the SWCC Art Advisory Board and instituted the student art show in the Cedar Bluff Heritage Festival, which she chaired for 10 years. She was also chair of the Tazewell County Fair Art Show for many years. She was a member of the Appalachian Artists Association and helped simplify the registration system for their show. Lou and Ed spent 18 winters in Plant City, FL where she joined the East Hillsborough Artists Guild, assisting with their show in the Strawberry Festival. She also helped several ‘snow bird’ friends with watercolors. SWCC has established a scholarship for art students with the name of the Ed and Lou Grimm Art and Soul Scholarship. The family will receive friends from 1 – 2 p.m. Monday, March 25, 2019 at Cedar Bluff United Methodist Church in Cedar Bluff, VA.
Funeral Services will be conducted at 2 p.m. Monday at the Cedar Bluff United Methodist Church with Pastor Annette Warren officiating. Entombment will follow in Greenhills Memory Gardens Mausoleum at Claypool Hill, VA. Pallbearers will be family and friends. In lieu of flowers, donations may be made to their art scholarship fund, P O Box SWCC, Richlands, VA 24641, or the scholarship fund at Cedar Bluff United Methodist Church, P O Box 209, Cedar Bluff, VA 24609. The family of Louise (Lou) Grimm is in the care of Singleton Funeral Service in Cedar Bluff, VA.
To send flowers or a remembrance gift to the family of Louise (Lou) Grimm, please visit our Tribute Store. "Email Address" would like to share the life celebration of Louise (Lou) Grimm. Click on the "link" to go to share a favorite memory or leave a condolence message for the family.